When it comes to the study of humans, nearly every public college has courses on anthropology. Anthropology is a term that has its roots in Latin and Greek words that combine Anthropos- and -logy to mean the study of humans. It is not a surprise that the vast majority of anthropology courses focus on humanistic characteristics and traits while at the same time ignoring the Biblical teaching on the same. For this reason, an introductory study of the three classification of humans: the natural man, Spiritual man, and carnal man will help us to keep things in Biblical perspective. What does man say about the characteristics and traits of humans? Depending on whom you talk to, anthropology is generally considered to be the study of human origins, races, classifications, relationships, physical character, nature, and culture of humans. Generally speaking, anthropologists believe that modern humans evolved along three general human evolutionary races that share distinctive physical traits. The original terms for these three races were Caucasoid, Mongoloid, and Negroid based on perceived traits and geographical origins. Charles Darwin probably is one of the best-known people who wrote and taught about this topic. This includes basic beliefs, languages, societies, biology, and cultures along with their sub-topics. What does the Bible say about the characteristics and traits of humans? In nearly every category, the Bible teaches a completely different view of human origins, races, languages, societies, biology, and culture. However, instead of dividing humans into three main races, humans are of one human race, that was created in the image of God (Genesis 1:26-28). Because of this, all other aspects of humanity are derived from this fact. In this passage, we see that God formed the body of man out of the dust of the ground. Scientists tell us that about 99.85% of the human body is made up of the elements of oxygen, carbon, hydrogen, nitrogen, calcium, phosphorus, potassium, sulfur, sodium, chlorine, magnesium, and sulfur. All of these elements are found in the earth and atmosphere (1). We also see that man has the spirit of life given to him by God. We see reference to this human spirit in numerous places in Scripture (See Genesis 45:27; Deuteronomy 2:30; Joshua 5:1; Psalms 51:17; Proverbs 18:14; Luke 1:47; Luke 2:40; John 6:63; 1 Corinthians 7:34; 1 Thessalonians 5:23; James 2:26). Finally, we see that when God breathed the spirit of life into man’s body, he became a living soul. We also see this referenced in Scripture (1 Thessalonians 5:23; Hebrews 4:12). What does the Bible say about the Spiritual traits of man? The Natural Man: He is born into the human family and lives in his natural state without being a child of God (John 3:1-8; Galatians 3:26; 1 John 2:22-23; 1 John 3:9-10; 1 John 4:3; 1 John 1:7). He does not have the Holy Spirit of God in Him and lives his life driven by three human motivators: the lust of the flesh, lust of the eyes, and pride (1 John 2:15-17). He is unable to know, much less understand the deep things of God, because He does not have the Spirit of God in Him that gives Him Spiritual wisdom. Therefore, He considers Spiritually Godly things to be foolishness and rejects God and His Word, which results in His destruction and rejection by God from having eternal life with God (Romans 1:18-32; 1 Corinthians 2:11, 14; James 1:23-24; 1 Thessalonians 2:13-16; 1 Peter 2:9-17; Revelation 14:9-10). 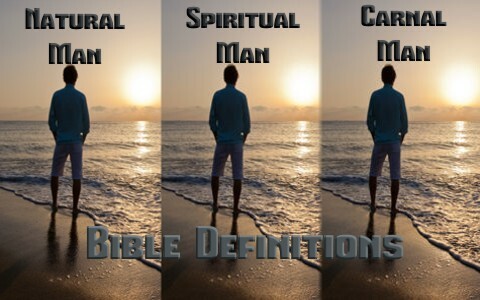 The Spiritual Man: He is one that is born again into God’s family and lives in a Spiritual state. Unlike the natural man, he does have the Holy Spirit in him, Whom he received at the moment of salvation when he trusted Christ as his Savior. He is born again as a child of God by his faith in Christ (Galatians 3:26). He is able to know the deep things of God because the Holy Spirit has revealed them to Him (Isaiah 11:2; Daniel 2:19-23; 1 Corinthians 2:4, 9-11; Ephesians 1:15-22). Because he has the Spirit of God in him, he has a new nature that is not driven by the lust of the flesh, lust of the eyes, and pride (Romans 5:5-9; 2 Corinthians 5:16-19; Galatians 6:15). Because He is born again by trusting Christ as His Savior, He will be saved from God’s wrath to spend an eternity with God (Psalms 2:2; Romans 1:18; Romans 5:9; Ephesians 5:6; 1 Thessalonians 1:10; 1 Thessalonians 2:13-16). The Carnal Man: He is one that is born again into God’s family, but lives and behaves as a man in a natural state living according to his carnal or fleshly desires. Instead of following the leading of the Holy Spirit, he chooses to allow the lust of the eyes, lust of the flesh, and pride tempt him, which produces ungodly works and the inability to grow in Spiritual maturity and discernment (Romans 7:14-25; 1 Corinthians 3:1-14). Only by immersing himself in the Word of God and putting off the works of the flesh can he abstain from his fleshly lusts and live a life that is pleasing to God and serves as a glorification of God before unbelievers (1 Peter 2:11-12). Sadly, the carnal man often claims he is a Christian, but demonstrates to the world that Christians are no different than anyone else. It is clear from Scripture that of all the studies that can be made about man, it is only these three Spiritual traits that have eternal significance. All other aspects of humanity cease to have any impact or meaning at the moment of death. Therefore, the Natural Man is born into the human family and lives in his natural state without being a child of God. The Spiritual Man is one that is born again into God’s family and lives in a Spiritual state. And the Carnal Man is one that is born again into God’s family, but lives and behaves as a man in a natural state living according to his carnal or fleshly desires. Only by the Holy Spirit of God can any of these three be conformed to the image of Christ (Romans:9-26-29). Previous post: What Does Being “Free From Sin” Mean? Next post: Who Was Jezebel?